Relive all of the action as Arsenal defeat Vorskla 3-0 in the Europa League. And that is all we have time for tonight. I've been Matt Dawson, thank you very much for joining us here at VAVEL UK. 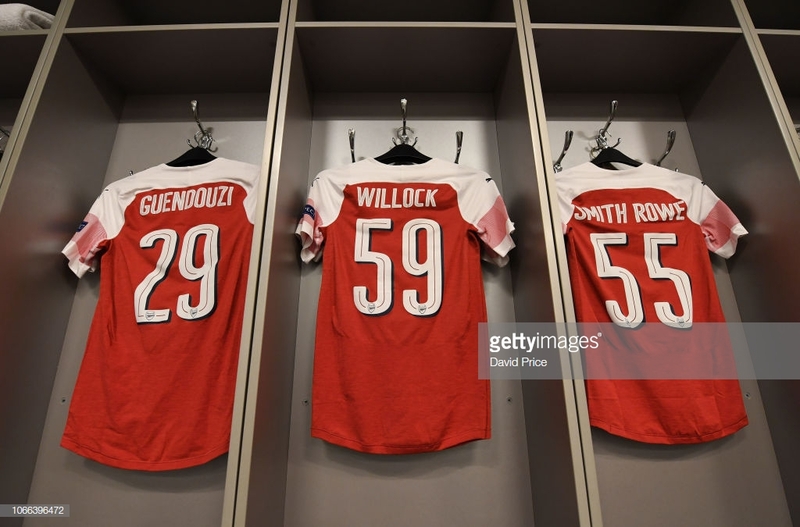 In total Arsenal handed a total of total of three debuts out as Charlie Gilmour, Zech Medley and Bukayo Saka were all given nights they'll never forget. Meanwhile the youngsters who started also made a very positive impact and Unai Emery will be glad to have given his main players a rest ahead of the north London derby on Sunday. All very comfortable for Arsenal tonight who qualify as winners of group E. The Gunners unbeaten run has also been extended to 18 matches. The job was done in the first half as Smith Rowe opened the scoring with a tap in. Ramsey then doubled Arsenal's advantage from the penalty spot before Willock's assured finish made it three. The scorer of the first had a goal disallowed in the second period but that was the only downer from an excellent night for the Gunners academy graduates. No goals in the second half but it was easy as you like for Arsenal. 93' Almost a consolation for Vorskla as Careca tries to bend one from the edge of the boxes but curls it wide. 90' A late chance for Willock to grab a second as he gets slipped in by Saka but the goalkeeper comes out to deny him. 80' Vorksla pushing for a consolation goal now and they nearly find it through Rebenok but his effort is blocked well by Jenkinson. The hosts have finally come to life! 76' A final Arsenal change on the night as Guendouzi is replaced by another teenager Charlie Gilmour. 74' Good play from Saka for Arsenal as he gets down the left flank, gets past the defender and then forces Shust into making a save at his near post. 70' Finally Cech is called into action as he makes a smart save to keep his clean sheet in tact, getting down well to deny Perduta. Arsenal then go up the other end and almost add another through Smith Rowe but his effort is saved too. Vorkla choose to make a change after as Kane is on. 68' Another Arsenal debut as Bukayo Saka who only turned 17 a few months ago is on in place of Aaron Ramsey. 64' Well this is a very bizarre situation. Lichtsteiner's ball into the box is missed by everyone and it finds its way to Smith Rowe at he back post who has another tap in. He looks utterly perplexed at how easy he's been allowed to stroll in but after a period of delibartion the goal is ruled out. I'm not quite sure what for but it remains 3-0. 60' An Arsenal debut as Zech Medley replaces Rob Holding at centre-back. 55' The ball falls invitingly to Dallku on the edge of the box as Vorskla look to nab a goal back but he volleys over. 52' Excellent work from Nketiah as he uses a burst of pace to get away from Artur to surge into the penalty area. He then tries to square it for Ramsey but he is offside. Nketiah fashions a chance for himself moments later but scuffs a shot which is saved. 46' Back underway in the second half in Kiev. It's been a rather untroubling match for Arsenal's defenders so far which is probably a relief for Carl Jenkinson who is filling in at centre-back. He and Rob Holding have looked comfortable as a pairing. There may be an unfamiliarity to this Arsenal side with ten changes in total but they've been excellent up to now. Nketiah has shown good movement in attack whilst Maitland-Niles is providing plenty down the left. Smith Rowe has continued his impressive form this term whilst Willock has put in a very mature display in midfield too. All very comfortable for Arsenal so far. Vorskla have been poor and as a result they are three goals down against a makeshift Gunners XI. They lead thanks to goals from Smith Rowe, Ramsey and Willock at the break. 45' A wild swipe towards goal, or rather away from goal from Kulach as he spots Cech slightly off his line but gets it all wrong as it sails wide. 41' A first Arsenal goal for the 19-year-old who triples the Gunners advantage. Vorskla lose possession to Elneny who then slides in Willock who has acres of space to run into. One of the defender's manages to recover but Willock checks back and then passes the ball beyond the goalkeer from the edge of the box. Very nice finish. 36' A first change of the night for Vorskla as Sapai is replaced by Careca. 33' Smith Rowe dinks the ball over the defence and into Nketiah who is then pressurised by the goalkeeper and as a result forces a shot wide. 32' Another booking for a Vorskla player as Sharpar is shown a yellow card after a foul on Willock. 29' Sklyar is the first man to be cautioned on the night as he goes into the book for a late challenge just inside Vorskla's half. 27' Aaron Ramsey is bundled over inside the area by Perduta and the Gunners have a penalty. The Welshman then picks himself up and calmly dispatches the spot kick. All too easy for the Gunners so far. 18' Nketiah wins a free-kick right on the edge of the penalty area. Ramsey looks to be in charge of the situation as he places the ball down in a position on the right side but his effort is poor as he puts it over. 15' It's so empty inside the ground that you can almost hear every word Petr Cech is saying. The Arsenal stopper has been very focal so far. 10' A third Arsenal goal this season for Smith Rowe as the teenager opens the scoring on the night. It's poor defending from Vorskla but it's very nice build up between Nketiah and Ramsey who exchange passes. It looks as though it may originally open up for Nketiah but it gets away from him and then the defender pokes the ball out of grasp from the goalkeeper straight to Smith Rowe who has a tap in. 6' Two chances in quick succession for Vorskla and Chesnakov. Firstly he gets an effort all wrong, hammering it so wide it finds a team mate out on the right flank. The ball then comes back in but Arsenal clear and it arrives at Chesnakov's feet again. He fires towards goal and Cech spills it but then claims without further worry. 3' First chance of the match goes the way of the hosts as Kolomoets moves to the front post and receives the ball from a free-kick but fires over from a tight angle. 1' Vorskla get us underway in Kiev. Very empty crowd tonight which is hardly surprising given the game was moved venue just 48 hours before kick-off. Tempartures are well below freezing in Kiev tonight. Apparently its -12°C which is far from ideal. Wrap up warm everyone! Players are in the tunnel and we are moments away from kick-off. There were fears that this match may not take place following Vorskla's disapproval of the game being moved to Kiev from Poltava. However, that hasn't materialised and we are just over 20 mintues until kick-off. Plenty of new faces on the Arsenal bench for us to get to know. Aside from Emi Martinez and Henrikh Mkhitaryan the rest of the substitutes are all incredbly young. Zech Medley, who has featured among the subs already this season is there, as is Jordi Osei-Tutu. 19-year-old Charlie Gilmour is in the squad, whilst there is room for talented 17-year-olds Tyreece John-Jules and Bukayo Saka. The latter is supposedly highly rated at the club. So the Gunners make a whopping ten changes to the side that beat Bournemouth with the only man to retain his place being Rob Holding. Petr Cech, Aaron Ramsey and Eddie Nketiah all start as expected. Lichtsteiner is back from injury at right back whilst Ainsley Maitland-Niles will play at left back. Carl Jenkinson slots in at centre half which will be interesting to watch. There's also a first appearence of the season for youngster Joe Willock. Vorskla starting XI: Shust, Perduta, Dallku, Chesnakov, Artur, Sapai, Sklyar, Sharpar, Rebenok, Kulach, Kolomoets. Subs: Sergiychuk, Mysyk, Careca, Tkachenko, Chizhov, Sakiv, Kane. Arsenal starting XI: Cech, Lichtsteiner, Jenkinson, Holding, Maitland-Niles, Guendouzi, Elneny, Willock, Ramsey, Smith Rowe, Nketiah. Subs: Martinez, Osei-Tutu, Medley, Gilmour, Saka, Mkhitaryan, John-Jules. We have news of the teams in Ukraine. That's all your pre-match build up for now, join us from around an hour before kick-off for the confirmed starting XIs followed by all of the action throughout the 90 minutes. The only meeting between the two teams came earlier in the group stages of this season's Europa League with Arsenal winning 4-2 at the Emirates. The Gunners were 4-0 up thanks to a double from Pierre-Emerick Aubemyang and goals from Welbeck and Ozil. But Vorskla scored twice late on through Volodymyr Chesnakov and Vyacheslav Sharpar. The Ukranian side are missing three players for the visit of Arsenal with Denis Vasin, Aleksandre Kobakhidze and Dmitry Kravchenko all set to be absent. Controversially Unai Emery decided to leave Mesut Ozil out of the starting XI at the weekend. That means that he will likely start in Ukraine on Thursday. The same can be said for Aaron Ramsey who has regularly been on the bench in the Premier League. Petr Cech will probably start in goal whilst Eddie Nketiah could be in line for his first start of the season. Stephan Lichtsteiner has returned to full training after a muscle injury sustained against Blackpool whilst Alexandre Lacazatte may come back into the fold after missing the trip to the Vitality. Laurent Koscielny made his eagerly awaited return following an Achilles injury on Monday night for Arsenal's U23s but this match will likely come too soon for his first-team appearance since May. Nacho Monreal remains on the treatment table. Arsenal ended a three-match drawing streak in the Premier League on Sunday with a 2-1 win over Bournemouth, a victory that extended their unbeaten run to an impressive 17 games. A trip to Eastern Europe can be tricky but the Gunners will be hoping they have enough not to lose for the first time since August. The Gunners come into this affording the ability to take a bit of a back seat. They secured qualification to the knock-out stages last time out in a 0-0 draw with Sporting at the Emirates. It was a game unfortunately marred by a broken ankle to Danny Welbeck but Arsenal sit comfortably at the top of group E on ten points. Vorskla can still mathematically qualify for the next round of the Europa League but things are currently out of their hands. They'd have to beat Arsenal on Thursday evening and hope Sporting drop points to Qarabag. If that was to occur then Vorskla would then have to beat Sporting on the final match day and rely on Arsenal to halt Qarabag. As things stand both Vorskla and Qarabag are on three points. The Ukranian's finished third in their domestic league last season and are making their first appearance in the group stage of the Europa League since 2011/12. This term Vorkla sit fourth in the Ukranian Premier League against 16 matches, eight points off third place Dynamo Kiev, whose stadium the match will take place in tonight. However, they haven't won in their previous three games and therefore come into this one in poor form. The first thing to note is that tonight's match will not take place in Poltava as previously arranged. Instead, the match will take place in the Ukranian capital of Kyiv following the introduction of martial law into some parts of the country. A UEFA statement on Tuesday read: "FC Vorskla Poltava's UEFA Europa League match with Arsenal FC moved to Kyiv due to security concerns." As a result, the game will now be played in the Olimpiyskiy stadium. Hello and welcome to VAVEL UK's live text commentary of Vorskla Poltava vs Arsenal in the Europa League. I'm Matt Dawson and I'll be taking you this evening's match which is due to kick off at 17.55 GMT. Stick with us for the build-up followed by all of the action in Ukraine.